The balance of water masses in the world's oceans consists of two major processes: water mass formation and erosion. Most water masses are formed near the upper surface and sink. Furthermore, through either transformation or erosion, water mass properties are continually transformed, so that a water mass gradually loses its identity. Therefore, some types of water mass are formed below the surface layers through the mixing of water masses originated from the sea surface; however, in this chapter, we primarily focus on formation/erosion of water masses in connection with surface processes. 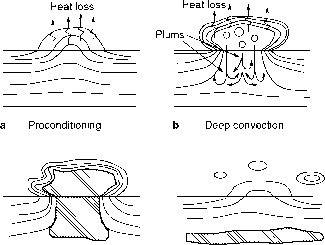 According to the penetration depth, water-mass formation is generally separated into two major categories, those of deep water and mode water. The second category of water mass normally sinks to a relatively shallow part of the world's oceans. In this chapter, we first discuss deepwater formation and then mode water formation. In a broad sense, the balance of deep water in the world's oceans consists of two major opposing processes: the supply of newly formed water masses through deepwater formation and the removal of deep water through mixing and erosion. Deepwater formation is closely related to the downward branch of the vertical circulation, which continuously supplies the water masses, while deepwater erosion is closely related to the upward branch of the vertical circulation, which continuously removes the water masses. Both processes are essential for water mass balance and thermohaline circulation in the world's oceans. For example, mixing in the deep ocean or upwelling through strong fronts continuously removes the old-age deep water, thus making room for the newly formed deep water and maintaining the thermohaline circulation. Since continuous removal of deep water is closely related to vertical mixing in the stably stratified ocean (requiring a supply of external mechanical energy), without the continuous supply of this energy the thermohaline circulation would not be sustained. The vertical circulation in the world's oceans is asymmetric in terms of upwelling and downwelling. In fact, the downward branch of the oceanic circulation is confined to a very few narrowly defined sites. Furthermore, the sites of the downwelling branch of the thermohaline circulation can be different from the major sites of buoyancy loss in the oceans. In particular, the formation of deep water can take place near the edge of the horizontal gyre or within the boundary currents, instead of in the middle of the gyre. In contrast, the upwelling branch of the circulation occurs on a much broader scale. Nevertheless, upwelling is also highly non-uniform in space. In fact, strong upwelling taking place along some of the narrow upwelling bands constitutes the major part of the upwelling in the world's oceans. One of such sites is located along the core of the Antarctic Circumpolar Current (ACC), where the strong westerly drives the strongest large-scale upwelling system in the world's oceans. In addition, strong upwelling along the equatorial band and coastal upwelling along the edges of the individual basins may constitute other major parts of the upwelling branch of the general circulation in the world's oceans. These relatively confined bands of strong upwelling constitute the major portion of water mass erosion in the world's oceans. Although water mass formation has been studied extensively, the opposite process, water mass erosion, has not received enough attention thus far. It is obvious that a complete theory of water mass balance in the world's oceans requires a more comprehensive study of both processes. Upon the passage, I made several trials with the bucket sea-gage, in the latitude 25' 13'' north; longitude 25'12'' west. I charged it and let it down to different depths, from 360 feet to 5346 feet; when I discovered, by a small thermometer of Fahrenheit, made by Mr. Bird, which went down in it, that the cold increased regularly, in proportion to the depths, till it descended to 3900 feet: from whence the mercury in the thermometer came up at 53 degrees; and tho' I afterwards sunk it to the depth of 5346 feet, that is a mile and 66 feet, it came up no lower. The warmth of the water on the surface, and that of the air, was at that time by the thermometer 84 degrees. I doubt not but that the water was a degree or two colder, when it enter'd the bucket, at the greatest depth, but in coming up had acquired some warmth (Warren, 1981). Bottom water properties in the world's oceans Deep water at low latitudes is much colder than the lowest temperature at the sea surface in winter-time; thus, such cold water cannot be formed locally, and the source of such water mass must be traced back to higher latitudes where cold winter conditions make the formation of water mass with such low temperature possible. The reasoning that cold water is formed at high latitudes and transported to low latitudes eventually led to the theories of thermohaline circulation in the world's oceans. Fig. 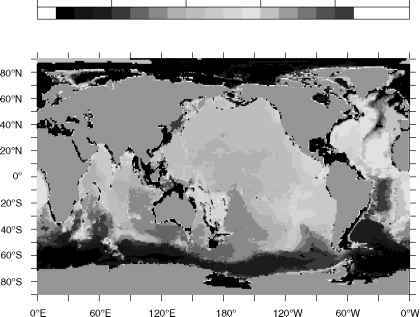 5.1 Potential temperature at the bottom of the world's oceans based on Levitus et al. 's (1998) Climatology. Note that the sea floor is rather shallow along the mid-ocean ridge in the Atlantic Basin, so bottom water over the ridge is relatively warm. See color plate section. • Cold water on the bottom is formed around Antarctica, primarily in the Weddell Sea and Ross Sea. From these source regions, bottom water is carried northward and eastward by currents and eddies. The cold water mass formed around the edge of the Antarctic continent that sinks to the bottom of the world's oceans is called Antarctic Bottom Water (AABW). • Cold bottom water spreads northward in each basin, and there is a tendency for the cold water to pile up in the western side of the basin. Bottom water temperature in the South Atlantic Ocean is the coldest among all basins. In the South Atlantic Ocean, only the Brazil Basin receives AABW directly. The eastern basin, the Angola Basin, does not receive AABW from the south; it is a basin closed to cold bottom water from the south. In fact, AABW's effluence to this basin is through a narrow gap near the equator, where relatively cold water moves eastward and finally reaches theAngola Basin from the northern opening passage. The dynamical role of blocking and guiding by bottom topography will be discussed in later sections. • At the northern end of the North Atlantic Basin there is a source of relatively cold water, which originates from the Norwegian and Greenland Seas. This water mass is called the North Atlantic Deep Water (NADW). Over the past century, theories of thermohaline circulation have been developed in order to explain the general circulation related to the formation and spreading of bottom water and the connection with water in the upper ocean, where surface thermohaline forcing prevails. Our goal in this chapter is to explain the physical phenomena and the dynamical theories of the thermohaline circulation in the world's oceans. Fig. 5.2 Oxygen concentration P15 section (approximately along 165° W) from WOCE. The contour increment is 10 |xmol/kg, and the concentration level between the yellow and light purple color is 150 |imol/kg. 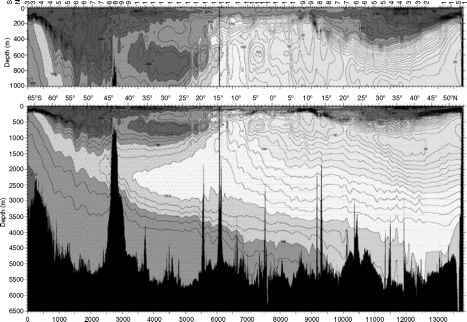 The concentration in the bottom layer in the Southern Hemisphere is above 190-200pmol/kg (Talley, 2007). See color plate section. that, in the Pacific Basin, water of Antarctic origin with a high oxygen concentration fills up the lower part of the water column in the Southern Hemisphere. 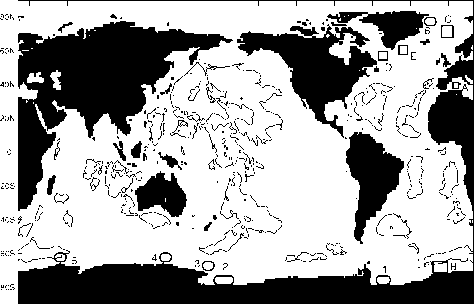 In contrast, water with very low oxygen concentration occupies the depths near 1 km in the high-latitude portion of the North Pacific Ocean, which indicates the poor ventilation of the water mass at these locations. In addition, deep water with low oxygen concentration in the North Pacific Basin implies that there is no deepwater source in this basin. The lack of a deepwater source in the North Pacific Ocean is in great contrast to the abundant deepwater formation in the North Atlantic Ocean, and this contrast between the North Atlantic and North Pacific Oceans is one of the major features of the global thermohaline circulation under modern climate conditions. Deep water and bottom water in the Atlantic Ocean originate from marginal seas. There are primarily two sources: (1) along the edge of theAntarctic Continent, especially the Weddell Sea, and (2) Norwegian and Greenland Seas. Water properties in these marginal seas and their modification during the outflow process are vitally important elements of the global thermohaline circulation. The circulation in the Atlantic Basin is a typical example, a two-dimensional sketch of which is shown in Figure 5.3. Note that the circulation is a complicated three-dimensional phenomenon; thus, the flow directions indicated in this diagram should not be interpreted as the actual flow path in the oceans. Some of the dynamical details related to this diagram will be discussed in later sections. Fig. 5.3 Sketch of bottom/deep water formation and thermohaline circulation in the Atlantic Ocean. Denmark Strait and enters the open North Atlantic Ocean. During the process of overflow, substantial entrainments take place, enhancing the total volumetric flux of the deep water. In the open North Atlantic Ocean, deep water appears as the deep western boundary current moving southward along the eastern coast of the American continent, gradually sending its water mass to the oceanic interior. Although NADW may lose its mass through upwelling in the interior of the Atlantic Basin, one of the major pathways of NADW is through the wind-driven upwelling associated with the southern westerly and the subsequent northern return flow in the form of the Ekman flux. In addition, in the Southern Ocean, deep water from the northern source meets the bottom water from the southern source (AABW). Mixing between these two major sources of water masses in the deep ocean dictates the circulation in the abyss of the world's oceans. Regimes of deep/bottom water formation in the world's oceans Deep/bottom water is formed at many sites in the world's oceans. Although the details of deep/bottom water formation vary greatly from site to site, these sites can be classified into the two categories described below (Killworth, 1983a). An updated distribution of deep/bottom water sources in the world's oceans is shown in Figure 5.4.